This is m’new tool’s use. Pretty simple really, but very useful. 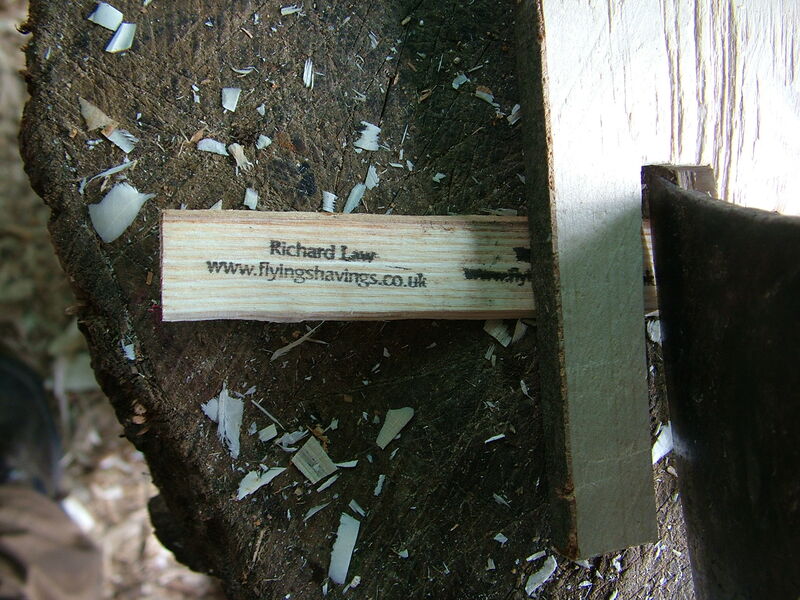 I print my own business cards on shavings from the shave horse ops. I get as many as I can on each shaving (sometimes as many as four). I then have to chop them to single cards. In the old-fashioned days, before the advent of The Super Card Holder Downerer, the cards flew around when chopped and the loss rate amongst the other shavings on the floor, was quite high, and even when stray cards were retrieved it involved bending – yuk! M’new tool holds the cards in place and on the first run of about 50 only two managed to escape to the floor. It works more or less with its own weight and the slot allows the axe to do its job and is wide enough to see that the axe is in the right place between stamps. I don’t need to be an ace at aiming the axe as I use a maul to drive the axe, unless they are very delicate shavings in which case I just lean on the axe. I’m posting this in the line of “Ugly jigs that work” that Peter Galbert runs on his excellent blog. This entry was posted in Appropriate technology, Green woodwork, hand made, Slow and tagged bending, business card, jig, shavings by Flying Shavings. Bookmark the permalink. Great idea, I am fan of home made jigs to make life easier and a job quicker. There is no way I could have guessed the purpose of this tool, ever. The fungi any more info on it? There are only a couple like it in the R Phillips book and they are puff ball related. Patience Sean! The next post will reveal the true identity of the fungarse – and it’s not a puffball, and it is in Phillips! I am taking a series of photos to post this evening.